Across the world July 14 is celebrated as Bastille Day but in the Northern Territory it is also an anniversary date marking the beginning of the Perron Government in 1988 following the abrupt leadership coup that ousted Steve Hatton as Chief Minister the previous day. This year marks the 30th anniversary of the rise to power of Marshall Perron as Chief Minister, arguably the most significant leadership change in the political history of the NT. Perron’s elevation to the Territory’s top job had profound consequences but at the time it was a measure of how dire the situation had become for the ruling CLP, coming as it did at the height of a period of instability and declining electoral support in the latter half of the 1980s. 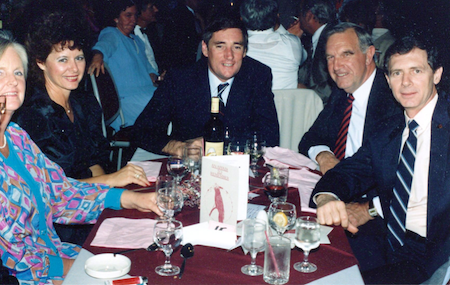 ABOVE RIGHT: CLP Annual Conference “Galah Ball” at the Verdi Club, Undoolya Road, in August 1988. From left: Unknown, Cherry Perron, Mike Reed, Federal National Party leader Ian Sinclair, and new Chief Minister, Marshall Perron. Reed was the new Minister for Primary Industry and Fisheries, having taken over that portfolio from Marshall Perron (as Minister for Industries and Development) after Perron became the CM. Photo: Alex Nelson. Perron took over as Chief Minister only a fortnight after the 10th anniversary of NT Self-Government – a significant milestone – and in turn was just shy of a month (June 4) since Shane Stone was elected as CLP president following a showdown at Jabiru with his predecessor in that role, Grant Heaslip. Heaslip had resigned as CLP president in May. In early April (just after a major flood hit Alice Springs), the Member for Flynn, Deputy CM Ray Hanrahan, resigned from all his portfolios and moved to the government backbench – and by July was sitting as an independent on the verge of resigning from politics altogether. All of this turmoil in mid 1988 was but a fraction of the upheaval that rocked the CLP for several years, effectively commencing in 1984 following the departure of first CM Paul Everingham into Federal politics and his replacement by Ian Tuxworth (a very good summary of this period is provided in Shane Stone’s online memoir published in 2014). AT LEFT: Launch of the CLP election campaign in February 1987 at the Verdi Club, Alice Springs. From left: Retiring Federal Member for the Northern Territory Paul Everingham, CLP president Grant Heaslip (partly obscured), Chief Minister Steve Hatton, Ray Hanrahan, Eric Poole, Roger Vale. Photo: Alex Nelson. A major irony pertaining to the CLP’s leadership woes lies with Perron himself, as he had resolutely refused to take on the role on three previous occasions despite being regarded by his colleagues (and most of the public) as the preferred choice as parliamentary leader. Perron never had any aspiration for leadership. He bluntly refused the opportunity in August 1977 after that month’s elections led to the loss of CLP Majority Leader Goff Letts and his deputy Grant Tambling; consequently Paul Everingham accepted the position, later to become the first Chief Minister. When Everingham resigned in October 1984 to contest the Federal election, Perron again refused to nominate for Chief Minister despite obvious support from his colleagues and from public polling. Ian Tuxworth was chosen over Nick Dondas to replace Everingham as the new Chief Minister. When, on May 13, 1986, it was the turn of Tuxworth to resign following loss of support from the party, Perron removed himself from all contention by resigning to the backbench where he remained until March 1987. Steve Hatton came from nowhere to become the next Chief Minister despite having been first elected into politics only two and a half years earlier. So finally when Hatton was obliged to resign in July 1988, Marshall Perron became the fourth Chief Minister in five years. This prompted a scathing front page editorial published by the Centralian Advocate, a very rare event in that paper’s history. Headlined “For God’s sake, CLP, grow up!” the editorial pulled no punches slamming the antics of the party and warning that Labor could win power if this kept up. There’s no question the CLP was at a low ebb by this time but in fact the rise of Perron and Stone were to prove critical in the party’s astounding recovery of its political fortunes a couple of years later. Perron had become Chief Minister – a position he never desired – at a time when that office had almost become a poisoned chalice; conversely Shane Stone, who made no secret of his burning ambition to enter Territory politics, was highly motivated to ensure the continuation of the CLP in power if his dreams were to be realized. 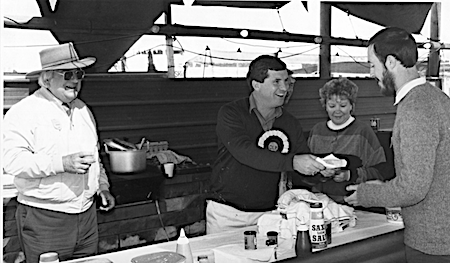 AT RIGHT: New party president Shane Stone at the old CLP show stand, Blatherskite Park, on July 1, 1988 – the 10th anniversary of NT Self-Government. From left: Dave Bottrall, Shane Stone, June Tuzewski, Alex Nelson. Two months later June Tuzewski was the CLP candidate for the ill-fated Flynn by-election. Photo: Ruth Andrews. Shane Stone proved to be a highly effective and energetic party leader, ably assisted by a team of supporters on the CLP’s Management Committee for whom the prospect of the party losing power for the first time was utter anathema. By late 1988, despite outward appearances, the CLP had become re-focused and honed into an almost ruthless party machine dedicated towards its political survival. That the CLP was back on track was palpably felt within the party as early as August 1988 during the Annual Conference held in Alice Springs but there was no illusion of the magnitude of the task ahead to win back public support. Perron’s first major test was the Flynn by-election scheduled for September 10 following Hanrahan’s resignation on August 15. Perron had revealed his misgivings on the day he became CM: “I’m not quite happy to fight a by-election – I don’t think any Government is. A by-election is always an opportunity for the electorate to give the Government a message without actually changing it” (Centralian Advocate, July 15, 1988). Perron was spot on. Quite apart from all the political turmoil, Alice Springs had reached the limit of tolerance on development versus heritage issues, too. On the night of July 31, Marron’s Newsagency was suddenly bulldozed, provoking uproar across the town. Within a fortnight news emerged the old Pioneer Walk-in Picture Theatre in Parsons Street had narrowly averted the same fate; consequently heritage issues became a dominant theme of the by-election campaign. The CLP was smashed, suffering its worst defeat by far with a swing of more than 21 per cent against it and polling last out of three candidates. 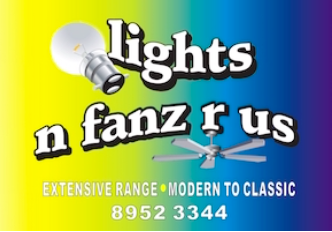 The CLP’s preferences enabled the rival NT National’s candidate Enzo Floreani to overhaul Labor’s Di Shanahan to win the seat. This result still ranks as one of the CLP’s greatest losses in its history. 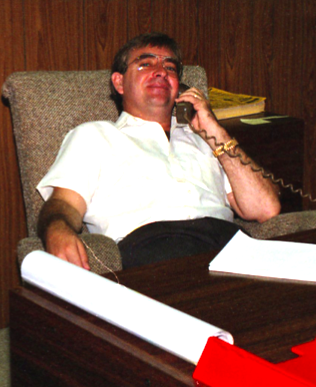 AT LEFT: Ray Hanrahan, Member for Flynn, in his electorate office in Alice Springs, during the NT election campaign of February-March 1987. He was appointed as Deputy Chief Minister following his re-election, the first from Alice Springs appointed to that role. Photo: Alex Nelson. The scale of the CLP’s rout in Flynn (formerly a safe seat covering a portion of urban Alice Springs and all of the rural area) was an immense shock as it was clear no seat held by the CLP in the NT could be considered safe. It was a wake-up call that prompted the Government and party to re-assess their position and re-double efforts to retain power in the NT. It’s fair to claim the Flynn by-election of September 10, 1988, was a critical turning point in the Territory’s political history. Both the party and Government became far more disciplined. Strict controls were imposed on members speaking to the media about party affairs, on pain of expulsion if caught in breach of the rules. After several years of controversy and poor publicity during which the CLP often complained of being misreported or taken out of context, the media generally was treated with considerable caution and, especially with the ABC, deep suspicion and outright hostility. The ABC was regarded as overtly supportive of the Labor Party and, indeed, to a large extent often troubled the NT Government more than the Opposition. All local radio and TV broadcasts were monitored, recorded and transcribed by the Government. The Perron Government considerably tightened access to its members and increased control over what was discussed – the era of Government “minders” had arrived with a vengeance. The new administration quickly implemented key changes in resources and personnel, too – in Alice Springs, for example, the Office of Chief Minister was relocated from the upper level of the National Bank building in Todd Mall (comparatively well hidden) to ground level at the new Heenan House (later Anangu House) in Gregory Terrace. 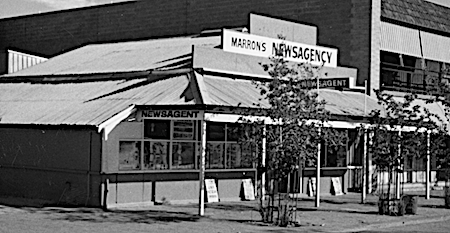 ABOVE RIGHT: Marron’s Newsagency, the last original retail shop in Todd Street / Mall. It was demolished overnight on July 31, 1988, which was a major contributing factor for the CLP’s drubbing in the Flynn by-election on September 10. Photo George Brown. Consideration was apparently given to closing the office in Alice Springs but the loss of the Flynn by-election ensured it remained open; however, the long-serving ministerial officer Clark McGorman was sidelined by the appointment of Paul Scott, previously the head of the Department of Industries and Development in Alice Springs – and whose minister was Marshall Perron before he became the CM. Scott was a proficient minder and political operative for the NT Government in Alice Springs. He also became an active party member who nurtured an ambition to enter politics; these plans were thwarted in the bitter preselection struggles of 1993-4 but he continued his role in the Office of Chief Minister until 1999. Changes were afoot in the local print media, too. In August 1988 it was announced that the Centralian Advocate’s veteran journalist (since 1967) and managing editor (from 1978), Bob Watts, would be transferred to the NT News in Darwin, and in turn would be replaced by the Sunday Territorian’s inaugural editor, Gary Shipway. This news came a month after the scathing front page editorial savaging the CLP when Marshall Perron became Chief Minister – possibly this was a factor in the changes at the Advocate but Shipway’s appointment, effective in September, certainly brought about a change in culture that was far more sympathetic (if not subservient) to the interests of the CLP in the Centre. Paul Scott and Gary Shipway, both in their early thirties, quickly became firm friends. These local changes were concurrent with rapidly developing close ties between the Government, CLP, and News Corp in the NT, which at times was quite openly flaunted. In years gone by the independence and fairness of the Centralian Advocate was occasionally challenged (and vigorously rebutted) but the change of management style that occurred during the early period of the Perron Government fundamentally brought an end to any real semblance of editorial independence from that time onwards. It has never recovered from that loss. There were other significant changes that occurred during the early years of the Perron Government. One was the departure of CLP president Shane Stone from Alice Springs to Darwin in 1989. 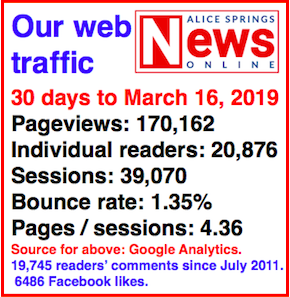 This move was necessitated by the massive workload of being the CLP president at a critical juncture of the party’s political survival – it simply wasn’t practical to maintain a home base in Alice Springs. The move proved fortuitous to Stone’s later political career. History now clearly shows that leadership of political parties in the NT can only be successfully conducted from an electoral base in Darwin (Gary Higgins, take note). 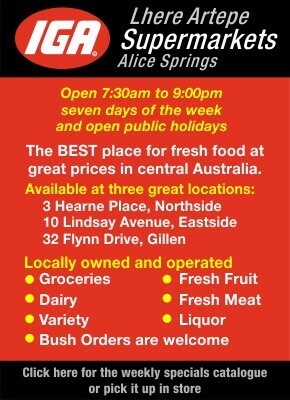 Shane and Josephine Stone moved to Alice Springs in January 1986 and commenced their first legal practice in Colacag Plaza (74 Todd Street) – coincidentally the same address where the CLP established its first local members’ electoral office in 1974. When the Member for Araluen, Jim Robertson, resigned in March 1986, Shane Stone put his hand up for preselection as the CLP candidate – he had only been in town no more than two months! 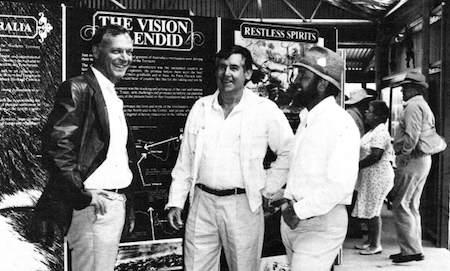 AT LEFT: Happier days: Steve Hatton at the Department of Primary Production display in the Maurie Johns Pavilion at the Alice Springs Annual Show, July 1985. Photo: Alex Nelson. 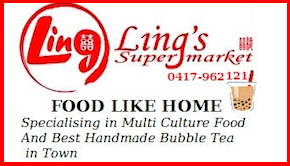 Stone was but one of a field of nominations seeking CLP preselection for the plum safe seat. The front runner was widely tipped to be activist magistrate Timothy Hinchliffe but instead it unexpectedly went to Eric Poole, the Chairman of the NT Tourist Commission. (In December 1999 I was informed by a member of that preselection committee they had been instructed to choose Poole – apparently the whole process was a charade. Whatever the case, Magistrate Timothy Hinchliffe was disillusioned by the whole business, and at the end of 1986 accepted an appointment to the bench of the Supreme Court of Papua New Guinea. Hinchliffe’s departure was a significant loss but quite likely he was regarded as a potential threat to the existing political leadership of the CLP). Poole managed to retain Araluen for the CLP on April 19 despite a swing of 16% towards Labor’s candidate Di Shanahan. This poor showing was undoubtedly a contributing factor to CM Ian Tuxworth’s demise less than a month later. Shane Stone initially was also regarded by some in the CLP with considerable suspicion. In January 1987 he succeeded in defeating incumbent Denis Collins for preselection as the CLP candidate for Sadadeen. This prompted a rebellion in the ranks of the local CLP, and Collins went on to retain the seat comfortably in the March ’87 election campaign as a conservative independent. Thoroughly chastened, Stone learnt to bide his time and build up his profile and reputation in the CLP. 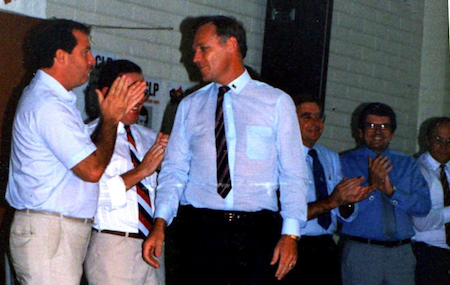 In August 1990 he won preselection for the seat of Port Darwin in a smooth transition from retiring member Tom Harris; and after winning the seat in October was instantly catapulted into the Perron Government ministry. (Next: The fight to survive – preparations for the 1990 NT election campaign). I always enjoy your historical perspectives especially around NT political history. Your contributions to the National Trust and Heritage Council are also very welcomed. 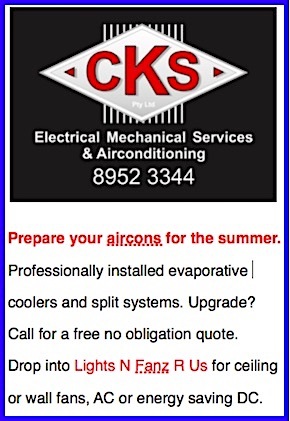 Looking forward to your next instalment.